You would think that life would have the decency to slow down during Lent, wouldn't you? After all, isn't this the time of year we should all be spending extra time in prayer and devotion? And yet, here we are coming up on Palm Sunday, Maundy Thursday and Good Friday - Lent is practically coming to a close, yet life just keeps on keepin' on even as we prepare for Holy Week. As you can tell, I was hoping for a quiet, peaceful Lent so I could really spend some serious devotional time connecting with God. I didn't quite get my wish. If you sometimes have the same trouble I have - i.e., finding the time to nourish your soul - I suggest we all take a deep breath and realize that God can, of course, be found in quiet meditation and prayer, but God can also be found in the details of our lives and our work, even when it seems overwhelming. Finding Him can just take us a little longer because we can get so distracted by the details. But God is there. He's with us as we rush through breakfast, He's there when we get all caught up in our latest calamity, He's there when we're running errands, He's even there when we think He's nowhere to be found. God is, in fact, our constant companion throughout the day. And the best way to connect with Him is to talk with Him as we go about our day, asking for guidance and encouragement whenever we need it. It IS a discouraging thing to think you don't have time for God, especially as we prepare for Holy Week. But let's open our eyes to the ways that God is always present with us - both in the quiet and in the not-so-quiet. 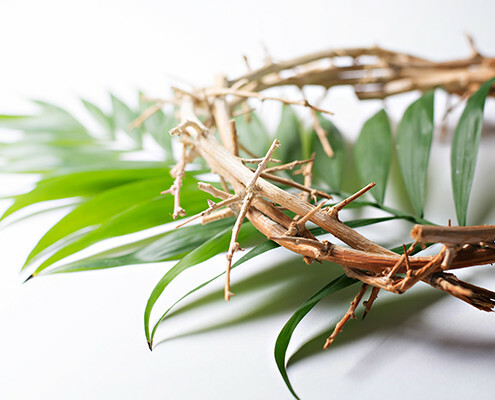 I look forward to worshiping with you on Palm Sunday, and hope you can join us on both Maundy Thursday and Good Friday. Have a holy and blessed Maundy Thursday and Good Friday. There is no better way to prepare our hearts to celebrate Christ's Resurrection!